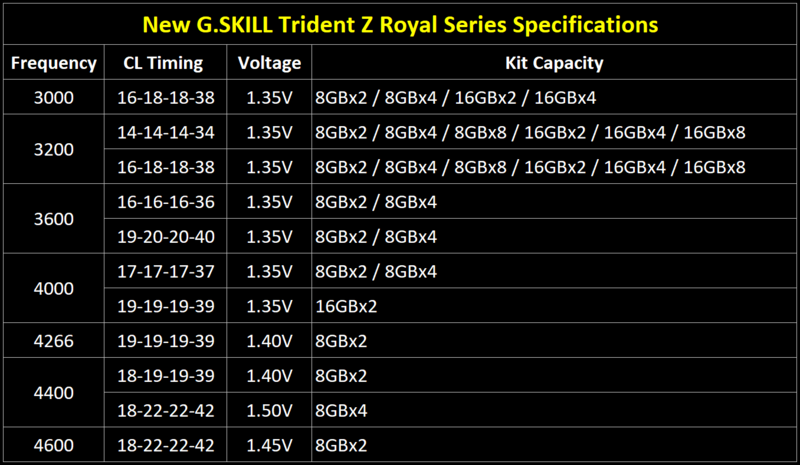 G.Skill has just announced the launch of their Trident Z Royal Series DDR4 RGB Memory kits. The memory modules were showcased back at Computex 2018 where we got to see an early design version of the kits and today, you can finally get them for yourself in two stunning design schemes. The Trident Z Royal series memory is available in a chrome polished heat spreader which is available in either gold or silver colors. The memory kit features a full length, crystalline light bar with eight different lighting zones which can be controlled independently through G.Skill’s RGB app. 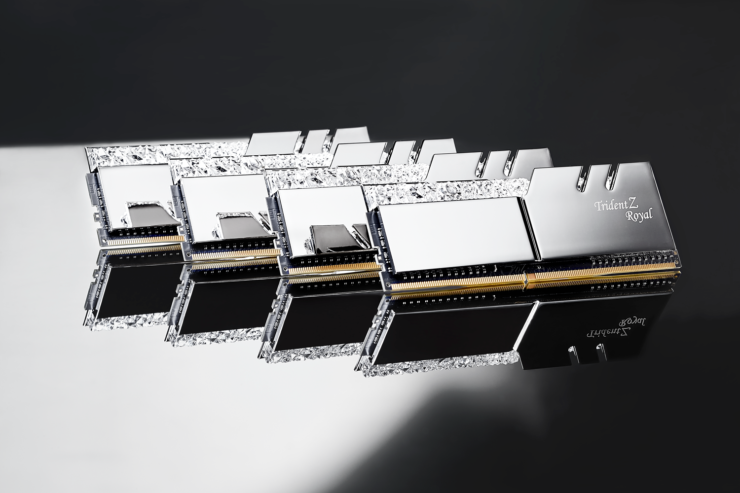 G.Skill has mentioned that the latest Trident Z Royal series memory kits are fitted with the ultra-high performance Samsung B-die DDR4 ICs which means performance is spectacular and overclocking will be a breeze. The memory kits are expected to be available in December 2018, around the globe. Pricing has not been mentioned. 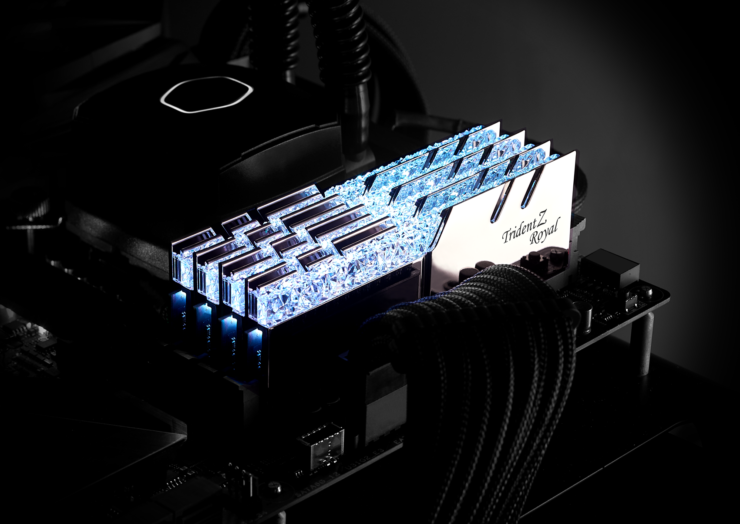 G.SKILL International Enterprise Co., Ltd., the world’s leading manufacturer of extreme performance memory and gaming peripherals, is launching Trident Z Royal series DDR4 RGB memory kits, featuring a patent-pending full-length crystalline light bar upon a polished heat spreader in gold or silver with stunning 8-zone RGB lighting. The patent of the crystalline design on PC components has been applied for across major countries. Available in high-speed specifications, the Trident Z Royal is first available from DDR4-3000MHz to DDR4-4600MHz at launch. With the perfect marriage of RGB lighting and speed, the Trident Z Royal is the ideal memory kit for any high-class system build. 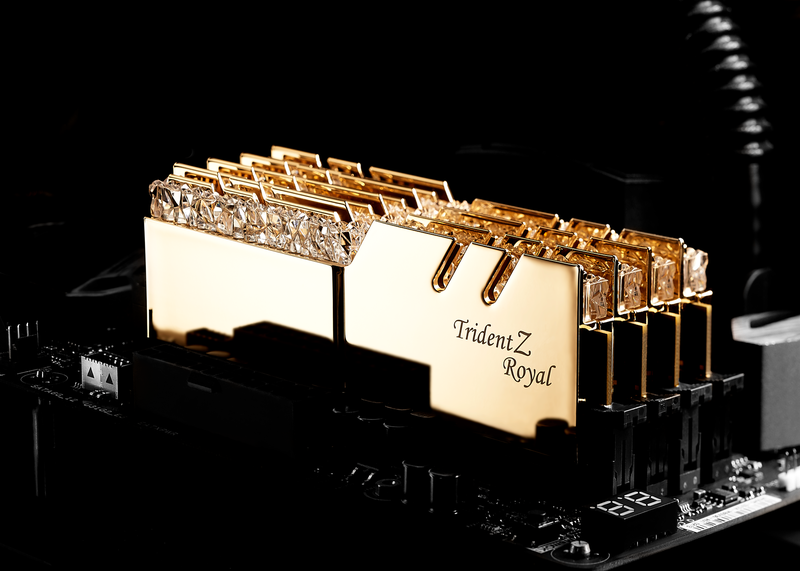 Trident Z Royal is the latest addition to the Trident Z flagship family, featuring a crown jewel design. Meticulously crafted to display just the right amount of light refraction, the crystalline light bar scatters the RGB colors in a magnificent display of LED lighting. Complementing the patented high-class light bar design, polished aluminum heat spreaders of gold or silver colors cools the memory modules in the award-winning classic Trident Z tri-fin design. And to help maintain the pristine shine of the heat spreaders, each Trident Z Royal memory kit comes with a piece of microfiber cloth to let you wipe away fingerprints and dust. Inside the Trident Z Royal is the next generation RGB module designed with 8 individually controllable lighting zones, which allows for smoother color transitions and provides an even more stunning lighting experience for your build. To control this next generation RGB memory, a new set of lighting control software will be available for download from the official G.SKILL website. 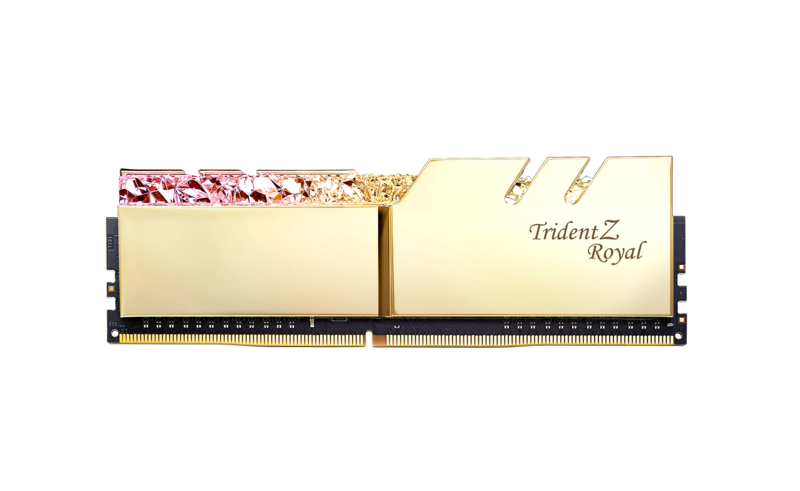 The new Trident Z Royal series memory kits are equipped with the latest Intel XMP 2.0 profiles for easy one-click memory overclocking and will be available via G.SKILL worldwide distribution partners in December 2018.